For several years, the Catholic Church has supported the creation of an independent process that would allow survivors of child sexual abuse to seek redress. One of the key recommendations from the Royal Commission into Institutional Responses to Child Sexual Abuse was the establishment of a National Redress Scheme for survivors of institutional child sexual abuse. Church leaders confirmed their commitment to the Scheme during the final hearings of the Royal Commission. The Commonwealth Government has established an independent agency to manage the Scheme. On 1 July 2018, the National Redress Scheme commenced, with survivors of child sexual abuse able to approach the Scheme at any time until 30 June 2027. Under the Scheme, applications for redress are considered by independent assessors who decide on the appropriate levels of financial and other support, such as counselling services. The Catholic Church and other institutions participating in the Scheme will meet the costs of redress that the Scheme determines, as well as administration costs to support the Scheme’s operation. 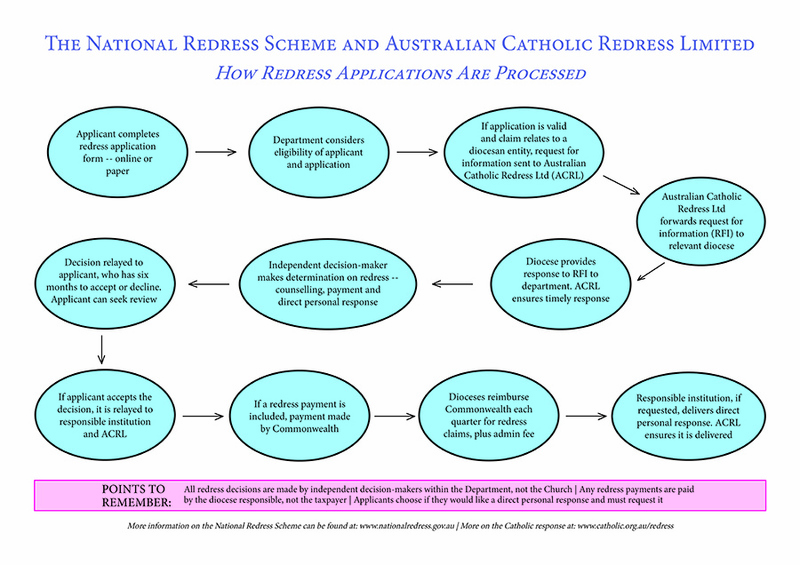 On 19 October 2018, Australian Catholic Redress Ltd was registered as a company that will oversee Catholic dioceses’ engagement with the National Redress Scheme. Australian Catholic Redress Limited provides a single access point for interaction between the Scheme and dioceses – and the approximately 5,000 Catholic sites for which they are (or have been) responsible. Australian Catholic Redress is the formal representative of Church authorities in the Scheme. The company will also help ensure all diocesan obligations under the Scheme are met, including the delivery of a personal direct response (if requested). Social Services Minister Paul Fletcher announced in December 2018 that 27 archdioceses, dioceses and eparchies had formally entered the Scheme. As of 1 February 2019, 34 of the 35 Australian Catholic archdioceses, dioceses and eparchies are now participating institutions in the Scheme, under the purview of Australian Catholic Redress Ltd. More than 99.8 per cent of the parishes, diocesan schools and diocesan agencies across the country are covered by those 34 dioceses. Several religious orders have also entered the Scheme, with more expected to join in the first quarter of 2019. This diagram outlines how applications for redress that relate to diocesan entities are processed.